Hyperthyroidism or thyroxicosis is a condition that encompasses several different diseases, all of which are characterized by hypermetabolism and elevated serum levels of free thyroid hormones. It is the result of the excess secretion of thyroid hormones from the thyroid gland, with or without their increased synthesis. The most common causes of hyperthyroidism include Grave’s disease, toxic multinodular goiter and toxic adenoma. There are several drugs that are known to cause thyroid dysfunction. Among these are the antihypertensive drug aminodarone, taken concurrently with a low intake of iodine, more common in the elderly (Trivalle et al 1996). Another cause is lithium therapy, which appears to impair the process of deiodination of T4 peripherally and within cells, inhibiting its conversion to T3 (Oakley 2002). Lithium is commonly used in psychiatry in the treatment of manic episodes of manic-depression. While other psychiatric drugs have not been associated with thyroid dysfunction, the author has observed the spontaneous manifestation of thyrotoxicosis with other psychiatric drugs such as risperidone. While the effects of the long term use of these drugs upon thyroid function has not been properly studied, these drugs are associated with an acute, potentially condition called neuroleptic malignant syndrome (NMS), manifesting as typical hyperthyroid-like symptoms including hyperpyrexia, muscle rigidity, altered mental status, tachycardia, diaphoresis, and cardiac dysrhythmia. Radioactive iodine-131 therapy is the most common treatment of hyperthyroidism, administered orally as a single dose, in capsule or liquid form. The radioactive iodine is quickly absorbed and taken up by the thyroid. The treatment results in a thyroid-specific inflammatory response, causing fibrosis and destruction of the thyroid over weeks to many months. This treatment is typically avoided in younger patients and is contraindicated in pregnancy. About 60% of patients become hypothyroid after treatment (Aizawa et al 1997). Hyperthyroidism is a typical heat-related disorder, and while no specific pathology is described in Ayurvedic medicine that correlates to our modern understanding of the disease, the signs and symptoms are clearly related to a severe pitta disorder. The underlying etiology of hyperthyroidism from an Ayurvedic perspective relates to the accumulation of ama, which aggravates pitta, and with the resultant heat pitta consumes ojas, leading to progressive weakness and debility. Thus treatment is orientated towards alleviating the specific manifestations, which may include similar diseases including jvara (‘fever’), daha (‘burning sensations’), trishna (‘thirst’), and atisara (‘diarrhea’). In Chinese medicine hyperthyroidism is related a combination of Liver fire rising, deficiencies of qi and yin, and Phlegm stagnation. The excess production of thyroid hormones correlates to Liver fire rising, which gradually promotes deficiencies in qi and yin. 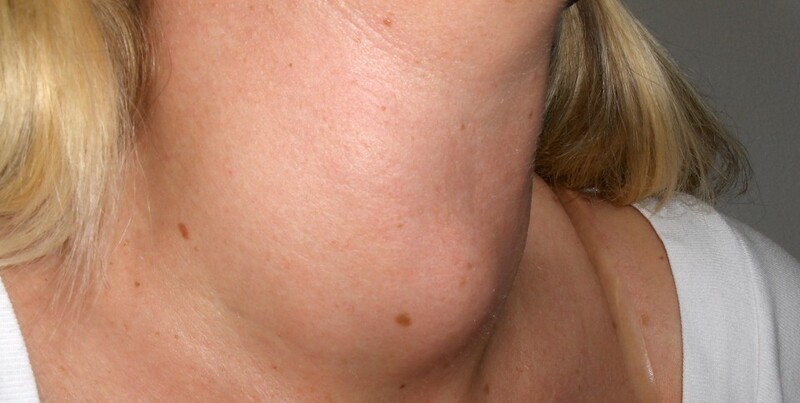 Phlegm stagnation specifically relates to the enlargement of the thyroid gland. From a nutritional perspective, hyperthyroidism may be facilitated by both deficiencies and excess amounts of certain nutrients and toxic compounds found in the modern diet and environment. Among the most common nutrient deficiencies found in hyperthyroidism are vitamins A, B, C, and E, as well as copper, iron and sulfur. There is a good deal of evidence that copper is an essential nutrient to consider in hyperthyroid states, with animal studies showing increases in serum T3 levels in concurrent copper deficiencies (Kralik et al 1996). Vitamin A and the B vitamins (PABA, pantothenic acid, thiamine,riboflavin, and niacin) appear to be important in regulating copper metabolism. Zinc acts as a copper antagonist and high doses of zinc without concurrent copper supplementation may predispose or worsen hyperthyroid states (in normalcy the zinc:copper ratio should be 5:1 in women, and 10:1 in men). In several studies hyperthyroidism is correlated with a relative deficiency of RBC, which by some interpretations, is reason to supplement for zinc. One study however showed that with the use of antithyroid drugs RBC zinc normalized without supplementation (Yoshida et al 1990). In another study, patients with hyperthyroidism had a lower RBC zinc level and increased urinary zinc excretion. Body zinc levels, excluding plasma zinc, was positively correlated with plasma thyroid hormone levels (Tsou et al 1993). This suggests that hyperthyroid patients may be trying to excrete zinc as an adaptive mechanism to inhibit thyroid stimulation, and that when thyroid levels are normalized, bioavailable RBC zinc levels also normalize. Given that the ratios for zinc to copper are lower for women than in men, it would suggest that an increased requirement for copper would predispose women to suffer the negative effects of a relative copper deficiency. Other compounds that appear to play a role in promoting hyperthyroidism include cadmium (from environmental contaminants and smoking), mercury (from amalgams and environmental contamination), lithium, and aluminum. As women are more susceptible to hyperthyroid states, the role of estrogen has recently been questioned. Specifically, it appears that estrogens may act as an accelerator of mineral uptake into the body, and in the presence of nutrient deficiencies could promote mineral imbalances in the body. Estrogen may act to enhance cadmium absorption, which accelerates thyroid function, and in a relative zinc excess, promote a copper deficiency. Similarly, if zinc levels are too low, estrogen can have the opposite effect, causing the body to incorporate too much copper and not enough zinc and thereby promoting hypothyroidism. Environmental and dietary estrogens appear to act synergistically with endogenous estradiol to promote heavy metal toxicity. In particular, xenoestrogens such as bisphenol-A (found in lacquers used to coat the inside of cans, and in dental sealants used to protect teeth) may act as potent xenoestrogenic compounds, which may explain why cats fed canned cat food have up to 11 times the risk of hyperthyroid diseases than cats not fed canned food. Another important consideration on the mineral status of hyperthyroid patients is the concurrent manifestation of intestinal damage, mediated through gluten intolerances (i.e. celiac disease), inflammatory bowel disease, or the consumption of phytate-containing foods that interfere with mineral absorption. Many of these foods, such as grains, cereal and legumes, as well as dairy and other foods that alter the gut flora (e.g. sugar, flour) could also directly promote damage to the gut wall, and promote immunological cross-tolerances and antibodies directed against the TSH receptor, as is seen in Grave’s disease. As hyperthyroidism is a life-threatening condition all treatments must be closely monitored by a licensed physician. Goitrogens (e.g. legumes, cruciferous vegetables) are theoretically used to inhibit thyroid production, but have been shown to be of little practical value, and in TNG, could exacerbate the underlying condition. 2. Decrease thyroid function, reduce heat, and nurture the vital energy.